Psychology 3 Edition NOTE: You are purchasing a standalone product; MyPsychLab® does not come packaged with this content. If you would like to purchase both the physical text and MyPsychLab, search for ISBN-10: 0134078799 / ISBN-13: 9780134078793. That package includes ISBN-10: 0133851990 / ISBN-13: 9780133851991 and ISBN-10: 0205206514 / ISBN-13: 9780205206513. MyPsychLab should only be purchased when required by an instructor. 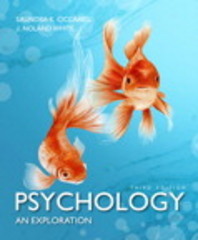 For courses in Introductory Psychology The most learner-centered and assessment-driven approach to psychology Throughout their number-one-selling Introductory Psychology franchise, authors Saundra Ciccarelli and J. Noland White employ a learner-centered, assessment-driven approach that maximizes student engagement, and helps educators keep students on track. Now in its third edition, Psychology: An Exploration draws students into the discipline by showing how psychology relates to their own lives. Clear learning objectives, based on the recommended APA undergraduate learning outcomes, guide students through the material. And assessment tied to these learning objectives lets students check their understanding, while allowing instructors to monitor student progress and intervene when necessary to bolster student performance. Also available with MyPsychLab This title is also available with MyPsychLab – an online homework, tutorial, and assessment program designed to work with this text to engage students and improve results. Within its structured environment, students practice what they learn, test their understanding, and pursue a personalized study plan that helps them better absorb course material and understand difficult concepts.